The Return of Bantu Education? All of us have been shaken by the 24 schools that were burned to the ground in Vuwani, Limpopo, in the last week. Whichever way you look at it, these acts of vandalism have set us back in our task of redressing the legacy of unequal education in our country. In 1953, Hendrik Verwoerd introduced the reprehensible policy of Bantu Education. This policy limited the educational opportunities of black South Africans to ensure a steady supply of unskilled and semi-skilled labour. Thirteen years later, in the Chamber of the National Assembly, Verwoerd was stabbed to death by one of the parliamentary service officers. The only thing tragic about that day was that Verwoerd’s policies didn’t die with him. Indeed, Verwoerd’s ghost continues to haunt us. Because, if you are a poor, black child, your chances of getting a decent education in a democratic South Africa are still very remote. And the uncomfortable truth, is that the gap in our education system is getting wider. In schools in the most affluent areas (‘quintile 5’ schools), the matric pass rate has remained steady at above 90% over the past three years. But in schools in the poorest areas, (‘quintile one’ schools), the matric pass rate has dropped from 70.3% to 61.6% in the last three years. In these schools, the physical science pass rate has dropped from 60.5% to 49.9%. The mathematics pass rate has dropped from 48.6% to 36.9%. It is not a question of funding. The Basic Education Budget stands at R219 billion – almost one-fifth of the total national budget. And, quite correctly, the state spends six times more on learners in poor areas than learners in more affluent areas. So how is that, two decades into our democracy, poor black children are falling behind? The answer lies in the quantity and quality of teaching. The truth is that, for every excellent and dedicated teacher in a disadvantaged school, there are many more who can’t teach and many more who won’t teach. And this problem will not go away until we break the SADTU protection racket that shields under-performing teachers from accountability. In this regard, Minister Motshekga’s plan to licence and professionalise teaching is a step in the right direction. SADTU will no doubt try and block this proposal. We hope that Minister Motshekga finds the courage that has so far eluded her when it comes to releasing the ‘Jobs for Cash’ report. If it ever sees the light of day, the ‘Jobs for Cash’ report will show that SADTU has captured six out of nine provincial education departments. We trust that Minister Motshekga’s failure to release the report does not mean that she has been captured by SADTU as well. Minister Motshekga has made much of her Department’s proposal for a ‘three-tier’ system made up of an academic stream, a technical stream and an occupational stream. In principle, the introduction of technical and occupational streams for learners who do not have the aptitude for the traditional academic stream is to be welcomed. We must be wary, however, of the target to offer 60% of all learners occupational subjects like hairdressing, beauty care, nail technology, upholstery and bricklaying by 2030. We must be cautious because weak schools will be under pressure to push failing learners into the occupational stream – even if these learners could have coped in an academic stream had they received better schooling. Take Kwabhamu Junior Secondary in Zululand, for example, one of the twenty-two schools that obtained a zero percent pass rate in the matric exams last year. The thirty-seven matric learners at this school didn’t fail because they were in the wrong stream. They failed because the school system failed them. The policy of Bantu Education was reprehensible because it limited the educational opportunities of poor, black learners. We must make sure that the ‘three-stream’ approach does not do the same. On that note, there is another potentially retrograde step in the offing. And that is the dilution of School Governing Body powers as contemplated in the Draft Basic Education Laws Amendment Bill. School Governing Bodies give communities a voice in how schools are run. They are the difference between a public school system in a democracy, and a state school system in an authoritarian regime such as Apartheid. We cannot redress the legacy of the past by mimicking the past. We must guard against the return of Bantu Education. And we must never go back to the state school system of the Apartheid era. The only way to exorcise Verwoerd’s ghost is by improving the quality and quantity of teaching in disadvantaged schools. This means breaking SADTU’s stranglehold on our public education system, so that every child is given a chance to succeed. Gavin Davis MP is the DA’s Shadow Minister of Basic Education. This is an edited version of a speech delivered in the debate on the budget of the Basic Education Department. It appeared in the Daily Maverick on 10 May 2016. In the background of the student protests stand the silent majority – young, mainly black, South Africans deprived of a decent basic education in a democratic South Africa. Many don’t finish school, let alone university. If the student movement is a fuse, this silent majority may well be the powder keg. Many people warned the government about an impending student fees crisis, including a ministerial committee chaired by Deputy President Cyril Ramaphosa. Yet the government was caught flatfooted by the conflagration that engulfed universities, Parliament and the very seat of its power at the Union Buildings over the last fortnight. The government’s knowledge of the coming crisis, and lack of will to do anything about it, tells us a great deal about the state of our democracy. It shows what happens when a governing party is unresponsive to the needs of its citizens, secure in the belief that it will be returned to power no matter how badly it governs. It is utterly confounding to see leaders of the student protest movement draped in African National Congress colours as they march on the party’s headquarters at Luthuli House. They seem oblivious to the idea that blind electoral loyalty to the governing party, regardless of its performance in government, is the very reason it has failed them. If people want a responsive government, they need to use the power of their vote to put it under pressure. Otherwise, the only way to get the government to act will be through riots, shutdowns and protest. This is not what the struggle for democracy was about. In a functioning democracy, it is incumbent on the government to gauge and process all pressing societal demands, not just the demands of those who shout loudest. Few interest groups are as organised and as vocal as the students have been. As a result, it can take years for some crises to manifest themselves as conspicuously as the university-funding crisis has in the last few weeks. By then, it is often too late. Indeed, as unfashionable as it may sound, there is a crisis brewing that is far graver than affordable university fees. And that is the failure of our school system to give every child access to a quality basic education. Far from engaging in mass protest, South Africa has been lulled into a sense of complacency when it comes to the quality of schooling. Every year, the Matric pass rate is celebrated and easy victories are claimed. Statistics indicating near-universal access to basic education are held up as proof of a good story to tell. The comparatively well-run Department of Basic Education and level-headedness of Minister Angie Motshekga go some way towards reassuring the nation that everything is on track. But we know, deep down, that something is very, very wrong with our school system. Those who finish school with marks good enough to get into university can count themselves among the fortunate few. Of the total number of pupils who entered Grade 1 in 2003, only 36% passed the National Senior Certificate in 2014, and just 14% qualified for admission to a university degree. Meanwhile, the 86% who didn’t make it to university are struggling to find work. According to the latest South Africa Survey, the unemployment rate among those whose highest level of education is Matric stands at 33.2%. By contrast, the unemployment rate for those with a degree is much less at 7.6%. On top of this, despite a steady increase of black students into universities over the last two decades, deep racial inequalities persist. Only 12% of black South Africans and 14.3% of coloureds enter higher education, compared to 58.5% of whites and 51% of Indians. Education analyst Nic Spaull notes that less than 1 in 200 black children who enter Grade 1 go on to pass Matric with marks high enough to study mathematics or science at university. The uncomfortable reality is that, if you are a black child born into a poor household, the odds of getting into university and building a rewarding career are stacked very firmly against you. The Statistics South Africa report on youth unemployment released last year found that, in comparison to other races, the proportion of black youth in skilled employment actually regressed between 1994 and 2014. Launching the report, the statistician-general said black youths between the ages of 25 and 34 “lost out in acquiring skills through the 20-year period and that is the crux of the issue of youth unemployment”. If the student movement is a fuse, the powder keg may well be the silent majority of young, black South Africans who leave school with little prospects of finding a decent job. The question is how long it will take for the simmering discontent to explode and, when it does, whether it will lead to a peaceful, democratic alternation of power or not. A responsive government in a functioning democracy would act to defuse the crisis in basic education, before it is too late. Nobody should tolerate an education system that hands down the inequities of apartheid from one generation to the next. Our government does so at its peril. Gavin Davis MP is the DA’s Shadow Minister of Basic Education. This article was first published in The Daily Maverick on 27 October 2015. In recent months we have seen an intensification of the Zuma faction’s campaign to capture key state institutions to protect the President from prosecution. The attempted purge of the Head of the Hawks, the National Director of Public Prosecutions and senior South African Revenue Service officials have sent a chill through our body politic. While these stories were dominating the headlines, another attempt at state capture was insidiously underway. On 26 September last year, Zuma-loyalist and Communications Minister Faith Muthambi quietly signed a document giving her overarching control of the SABC. This Memorandum of Incorporation turns the SABC from a public broadcaster into a state broadcaster, completing the Zumafication of the SABC. The Memorandum also gives the Minister new powers to recommend the removal of Board Members. Again, this is in breach of the Broadcasting Act, which empowers only Parliament or the Board itself to recommend the removal of SABC Board Members. Perhaps even more alarming is how the SABC Board’s authority over its Executive Directors (Chief Executive Officer, Chief Operations Officer and Chief Financial Officer) has been curtailed. The upshot is that Zuma’s henchman, Hlaudi Motsoeneng, is now untouchable at the SABC despite the numerous scandals that should have ended his career some time ago. In terms of the Memorandum, Muthambi now has the power to make Motsoeneng the Acting CEO and keep him there for as long as she wishes. If Muthambi wants Motsoeneng to be appointed as the permanent CEO, she can waive the requirement that the position needs to be advertised and other candidates shortlisted. Then, if Muthambi wants to re-appoint Motsoeneng when his contract comes to an end, she can do so unilaterally. If the Board decides it wants to discipline and/or suspend Motsoeneng, as the Public Protector directed it to do last year, Muthambi can now block the Board from doing so. And, to give Motsoeneng the best chance of surviving the DA’s court case challenging the legality of his appointment, the Memorandum makes the SABC liable to pay his legal fees. All these amendments to the SABC’s Memorandum of Incorporation were made without discussion with the Board, and against the wishes of many Board Members. Meanwhile, Minister Muthambi has already begun using her newfound powers to bully Board Members who do not toe the line. In December last year she wrote to certain Board Members asking them to give her reasons not to have them removed from office. Board Members perceived as too independent are reportedly being targeted and victimised. This Memorandum of Incorporation is only the first part of Muthambi’s plan to neuter the SABC Board. Shortly after assuming office last year, Muthambi raised eyebrows when she announced that she wishes to reduce the number of SABC Board Members and to change the way the Board is appointed. This year she will table legislation that will “clarify” her powers as Communications Minister, reduce the size of the board from 15 to 7 and revise what she calls the “current cumbersome process” of appointing the Board. Ominous indeed. It is not an exaggeration to say that this ‘hostile takeover’ poses the gravest threat to SABC independence since 1994. But it must not be viewed in isolation. Make no mistake; the attempted seizure of independent state institutions is a concerted effort to protect one man. Our constitutional democracy has never looked so fragile. Gavin Davis MP is the DA’s Shadow Minister of Communications. A version of this article was first published in the Daily Maverick on 11 February 2015. This glowing endorsement of the ANC, written on an Independent Newspapers letterhead alongside the ANC logo, was itself accompanied by an endorsement letter for the feature authored by ANC Chairperson Baleka Mbete herself. In response, the Independent Newspaper Group Editorial Director Moegsien Williams denied there was anything unethical going on. “As a rule, there is a ‘Chinese’ wall between the commercial and editorial units of our company primarily to protect our editorial integrity,” he said. It is too early to tell whether the advertising campaign – which is set to run once a month for the entire year – will influence reporting in the group’s newspapers. And it remains to be seen exactly how the feature will look and whether or not it will be clearly marked ‘advertorial’. What is apparent is that the newspaper group has engaged in a practice that could lead audiences to doubt its independence. Are you the biggest ANC supporter in the country? We’d like to hear from you. Tell us in an sms or email why you love the party or send a picture that shows your support. Great stories and pics will be published. SMSes charged at R1.50. 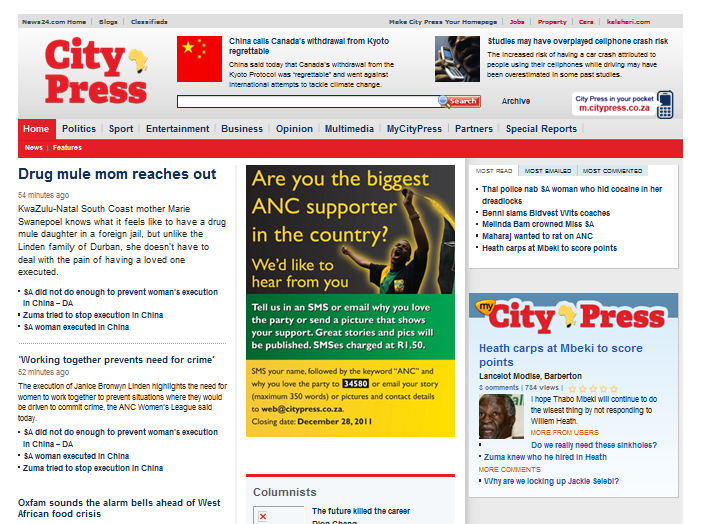 SMS your name, followed by the keyword ‘ANC’ and why you love the party to 34580 or email your story (max 350 words) or pictures and contact details to web@citypress.co.za, Closing date: 28 December 2011. If the call had been made for readers to send in their honest views of the ANC – whether good or bad – there would be little cause for complaint. The problem is that the City Press made no attempt to elicit any views on the ANC besides the overwhelmingly positive. It is doubtful that any feature published based on these vox pops alone could be anything approaching ‘balanced’. When the DA raised questions about this, City Press Editor Ferial Haffajee went on the defensive: “Can the DA really dictate how the media covers the ANC centenary? I’ve had a threat for our call to find the biggest ANC supporter,” she tweeted. “Any media study will find the DA gets way more than its proportionate share of coverage,” she tweeted later. But this misses the point. It is not the DA’s intention to dictate how the media covers the centenary. And we are not particularly concerned with how much overall coverage the ANC gets in relation to the DA either. If the DA punches above its weight media-wise, it is because the party works hard at getting its message across. All the DA is asking for is fair and balanced reportage of the ANC centenary celebrations. This will mean recognising both the achievements and shortcomings of the party in an informative way. If newspapers want to advance press freedom, they will do well to avoid falling into the Mantashe trap. Now is not the time for Stockholm Syndrome. Gavin Davis is Communications Director at the Democratic Alliance. This article first appeared in the The Witness on 6 January 2012.